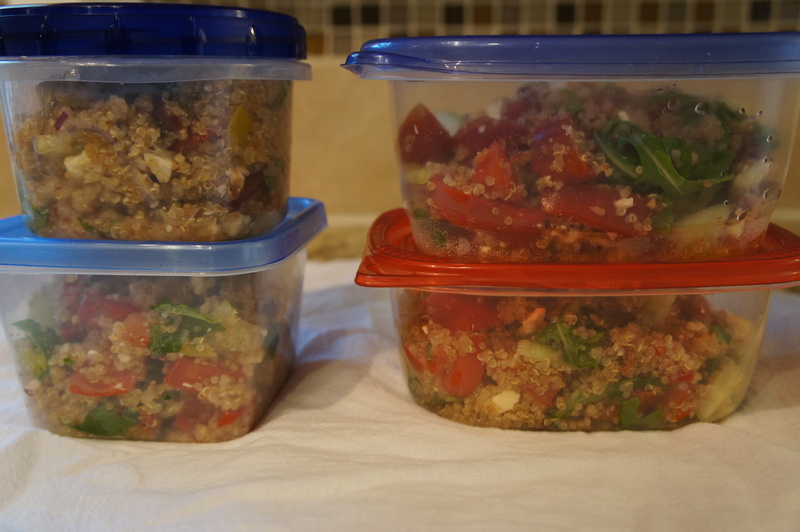 Last week, I posted a recipe that made me like quinoa. Today, I’m posting another one. 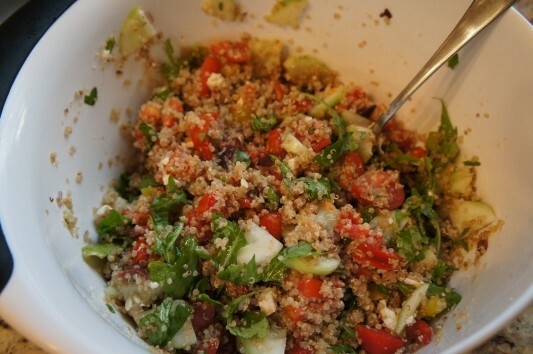 It is the exact same thought as the Tropical Quinoa Salad, except it is Greek. This means just a few swaps in ingredients. The majority of these ingredients were part of my first order from Mile High Organics. I used the same items I use in my go-to Greek Salad, just exchanged the lettuce for quinoa. It’s a bit more filling and even easier to pack up for lunches. This salad would be an excellent side dish for grilled chicken or lamb. It would be delicious stuffed into a pita with falafel or strips of chicken or tofu. It is also great on it’s own, chilled, right out of your lunchbox. Heat 1 tbs. oil in a large pot over medium heat, then add quinoa. 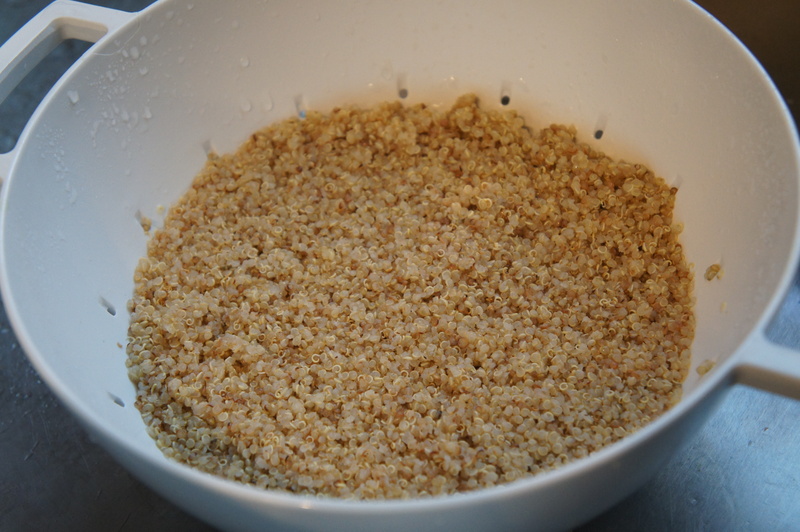 Stir to coat and allow quinoa to toast, around 2-3 minutes, until it smells fragrant and nutty. Once toasted, add 1 3/4 cups of water to the pot, stir once, bring to a gentle boil, then cover and allow to simmer for 20 minutes. Remove from heat, uncover and fluff with a fork. While quinoa toasts, heat olive oil in a large skillet over medium heat. Add onions and saute until fragrant and translucent, around 5 minutes, then add garlic and saute for another 2-3 minutes. Stir often. While quinoa simmers and onions saute, prepare all other ingredients. Prepare dressing by combining ingredients in a medium jar. Shake to thoroughly combine. Taste and adjust flavors as necessary. 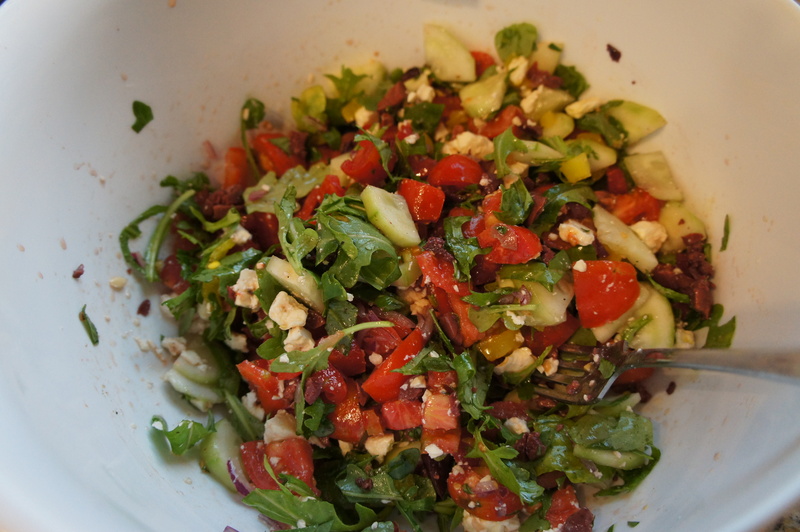 Combine all ingredients in a large bowl and mix well, then top with dressing. 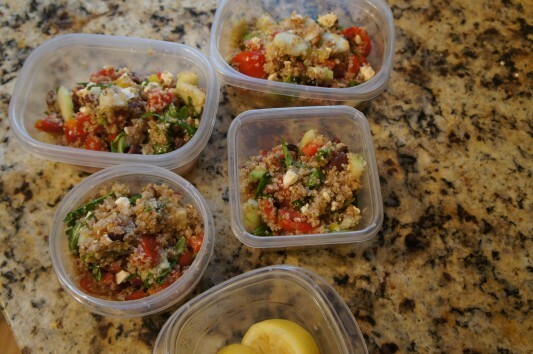 Toss to coat, then dish into individual serving containers for quick lunches throughout the week. i want to dip my chocolate in that dressing – weird?